If you don’t feel like cooking—or simply want a break from facing the high grocery prices in Canada’s North—you at least have some options in Iqaluit. In Nunavut’s capital city, in comparison to other places in the territory, you can find a fairly large choice of restaurants. For some reason during the past month, maybe because it was colder than usual ftom May into June, I felt focussed on food. 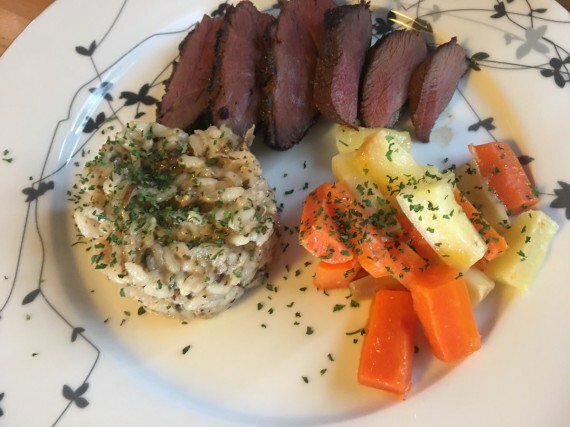 That led me to encourage local chef Sheila Lumsden to prepare a variety of Arctic foods, from muskox to Canada goose, for a story in the Nunatsiaq News. Goose prepared by Sheila Lumsden…a beautiful Arctic plate. 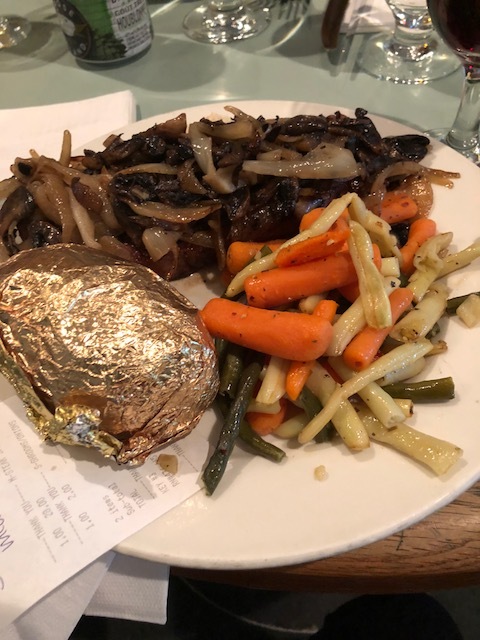 But when the Nunavut legislature went further into its spring sitting, and I was often too tired to think about serious food preparation, I started to sample the various restaurants around town, looking for the best deals at the lowest price possible. I aimed to spend no more than $30. I found many of these take-out meals were “desk-worthy” as well, that is, easy to eat while I continued to work. “Mamartuq”- yummy read words under the polar bear on the side of the Nanook Express truck, parked in front of Nanook elementary school. 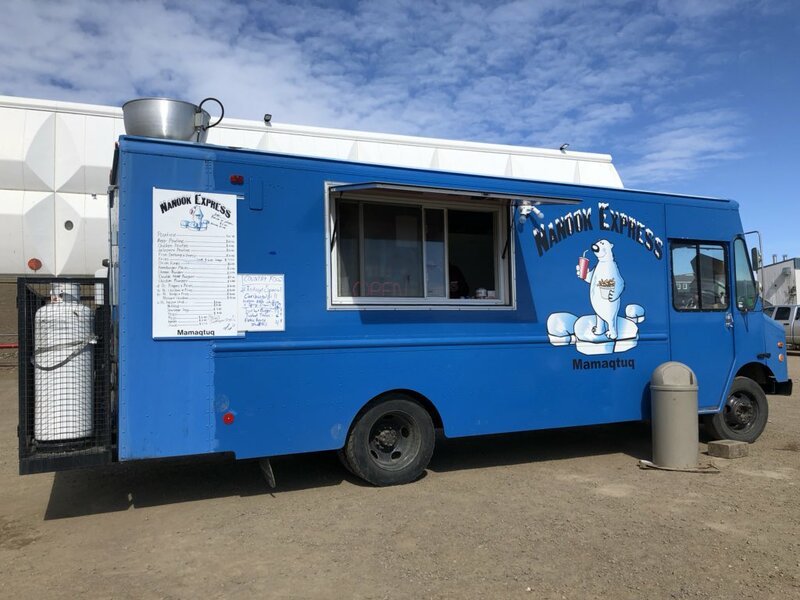 • Nanook Express food truck: When I stopped off there to buy my take-out meal, it was mainly because the idea of caribou bulgogi with rice and spicy cole slaw along with a turbot taco sounded pretty good. The caribou worked well with the sauce, in case you’re wondering! At $24 for the two, bulgogi and taco, this was by far the best and cheapest meal I found. • Yummy Shwarma (as seen below): The pizza, falafel, humous and stuffed vine leaves I ordered at various times from Yummy Shwarma were so tasty that they disappeared quickly. I didn’t take any photos. When I went in one evening, Khldoun El-Shamaa, who owns and operates Iqaluit’s first (and only) Lebanese restaurant, offered me a huge portion of salad with chicken, so much it lasted me for three meals. 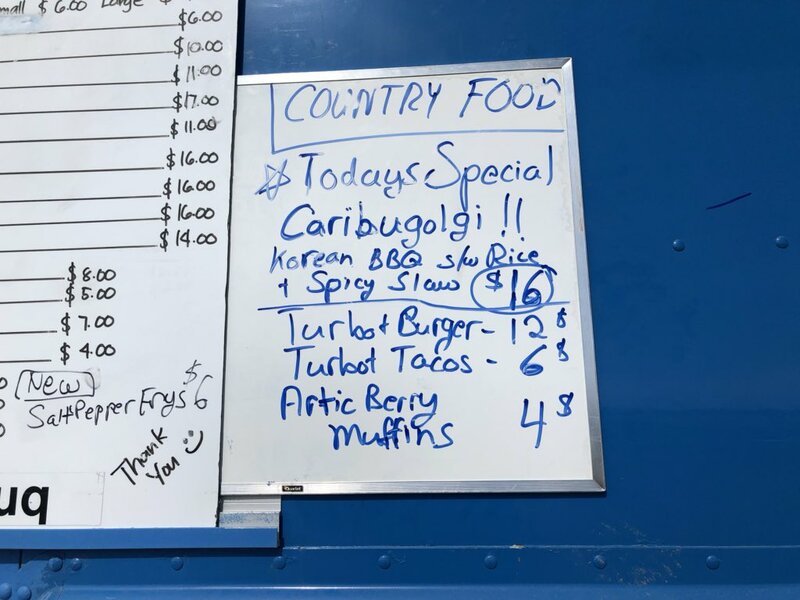 • The Snack: While you can spend a lot of money here on things like poutine and soda pop, one of the best lunch deals in Iqaluit has to be its generous chicken sandwich, made with fresh meat, all for about $10. • The Iqaluit Country Foods Store: You can buy a piece of dried Arctic char or smoked Arctic char for under $30 and count on eating well for more than one meal. 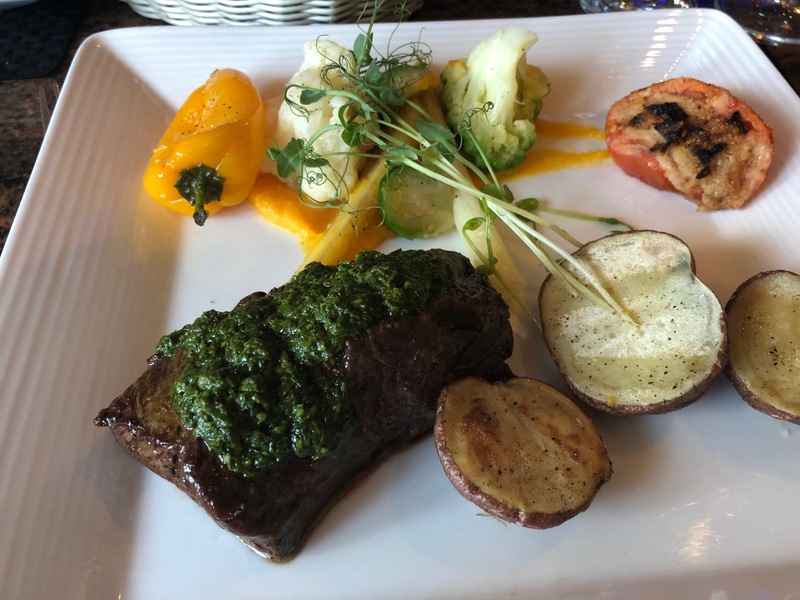 • Or if you have money you can go to The Discovery Inn and spend several times more than $30 on a meal: It’s expensive but the meal I ate there was great, a beef loin with spicy chimichurri sauce and vegetables. If you’ve been wondering about the image of the ice-floe lights which is my featured photo with this post, it’s the ceiling decoration at the Discovery Inn. If you have input on reasonable and good meals that you’ve had in Iqaluit, please send me a comment! In writing this post, I don’t want to sidestep the widespread hunger in Iqaluit, where the majority of Inuit don’t have enough to eat. The city does have a soup kitchen and a food bank, and they need our support: you can read more about the soup kitchen here.